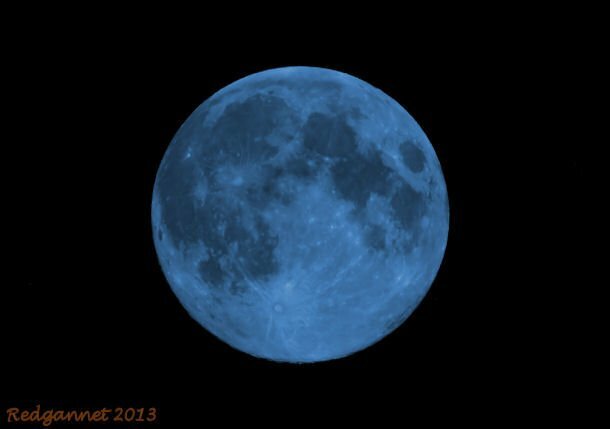 The definition of the term Blue Moon comes under scrutiny this week. There is a popular definition doing the rounds which states that a Blue Moon is the second full moon to fall within one calendar month. This has found favour recently as the definition of choice and has eclipsed the old, original requirement that the third moon in a four moon season, be known as the Blue Moon. I only mention this because a traditional Blue Moon is currently sailing slowly past my window and I had no idea of its significance until I came across an article in www.space.com. On Tuesday August 21st, 2013, the third full moon of the summer lights up the night sky with a fourth summer moon predicted, nay expected, certain even, before the Vernal Equinox on 21st September. The old definition was put forward by the Maine Farmer’s Almanac, but was misinterpreted in a popular magazine and brought about today’s more widely quoted definition (I have been guilty of perpetuating this mistake and wish to atone for my foolishness here). In a season of three months, be it Spring Summer, Fall or Winter, we would expect to see three full moons, but occasionally a foible of the calendar throws in a fourth. Oddly, the farmers of Maine came to know the third one as the extra. Incidentally, if you try to take a picture with a plain black background, such as the moon, or the inside of your camera bag for example, you may find a lot of red, blue and white spots that you may not otherwise notice on your normal birdy photos. These are often hot patches of pixels that are burning brightly on your camera’s sensor plate. They do not normally affect the photo unless you crop tightly, but they can be annoying. If you have a Canon DSLR camera, select the “Sensor Cleaning/ Clean Manually” facility from the menu (first ensure that you have a full battery). There is no need to do any manual cleaning, just turn the camera off and back on again. This often resets the hot pixels and improves the look of a close crop image.